Chile 2. To Argentina, via Paso Piuquenes & Paso Portillo. There are lines on the map, separated by a gap. These lines go up into the Andes, one approaching from the west, Chile, the other coming from the east, Argentina. All the mountain roads here go east and west. All thoughts of north-south progress remain on the plains outside the mountains. The traffic remains there too, so rather than fight for a place besides cars, we’ll spend some time traversing the range and then connect passes via some other means. First up: Paso Piuquenes to Paso Portillo, from Santiago, Chile to Mendoza, Argentina. Santiago – San Gabriel – Paso Piuquenes – Refugio Real de la Cruz – Paso Portillo – Refugio Portinari – Tunuyan – Mendoza. They say the only way to cross from Chile to Argentina near Santiago is the paved Cristo Redentor pass. They’re wrong. There’s a road leaving Santiago heading east that goes up to thermal baths sitting right against Andean mountain walls. Manhandle your way up that wall and drop into the valley on the other side, to Argentinean refugios stations on the valley floor, sheer rock wall faces cut straight down to guide your way. Remote, quiet, beautiful. Hard. Bikepacking friendly. Fully loaded tourer impossible. Days 1-2: Santiago to Termas del Plomo. Paved road climb leaving the city, start delayed by the usual faff of getting going after a break and nailing down any new setup issues. Get out of the city center sprawl and beeline to a roadside supermarket, Coke and sugary cupcake break. These civilization store stops then going to play some recurring role in the rest of the day’s riding. Snack breaks on a paved comb- we haven’t toured like this in a while. Next day. Coffee and empanada breakfast combo after a night camping riverside. We’re near the top of the paved road, eating procrastinating today’s riding, which will inevitably end in some amount of body readjusting soreness. A pack of four guys zip by on full carbon race bikes, support car squealing tires behind them with a rack of spare bicycle wheels. Apparently today is the day of some Santiagoan hill climb. Echoes of home abound in this country. The pavement gives way to dirt, leading up to a popular weekend destination glacial lake. A guy near the top sells empanadas and mote con huesillo, syrupy peach drink dessert. Past the lake, traffic all but disappears. Only the most adventurous make it all the way to the hot springs, where squares of dry land to camp on are surrounded by rivulets running cold. Deceptively insecure stone stepping paths bridge the campsites and mainland car park. We arrive just as darkness falls, rinse off in the baths and try to get a fire started with abandoned wood. But we should have brought some smaller kindling with us if that was what we wanted. Day 3: Across Paso Piuquenes to El Caleton. We crossed the Rio Yeso first thing this morning. The more conservative people said to bring rope to belay across, but now it’s mid-March at the end of summer, water levels are low. Stone cairns pointed the way across. An easy river. It’s not the main obstacle of this morning. That obstacle is the last 500m ascent to Piuquenes. The first 500m upwards this morning consisted of standard hike-a-bike, scrambling up the mountain path, intermittently rideable. But now we look ahead and see shallow switchbacks scaling straight up. Pushing up that slope isn’t an option. But we’re down a laptop and other accoutrements deemed unnecessary, so the bikes go onto our backs, and step by step we inch upwards. 100m vertical still to go, more or less. The pass is visible, finally, so stop checking the GPS because maybe now it’s better to just be ignorant of how much more is left. This is tough. We lived at 3000m for the last month, but that doesn’t count towards acclimatizing to exertion at 4000m. And while the pass is in sight, it’s on the other side of the bowl we’ve topped out at. Paul takes off, some time later while I’m nursing how little energy I have left and am stuck in a push-to-the-next-rock-rest-repeat cycle that hinders progress more than it helps, I’ll look up just to see Paul hoist his bike onto his back one last time for the final climb to the pass. Only half the bowl left for me. Today, this is my Dawn Wall. Day 4: El Caleton to Refugio Real de la Cruz. Stopped. A mostly rideable morning followed a blast down to the valley floor from the pass. That descent on the Argentinian side of the pass eminently rideable downwards, something fun to spark thoughts about what bikes to ride when after this trip is over. The end is on our minds now, on some level. This valley. The minor difficulties this morning were soft soil and thorns. 3 out of 4 tires are flat now, but we’re not exactly riding anymore today. The big difficulty of the day is staring us in the face. Rio Tunuyan. Some hikers kept mentioning horses and mules ferrying them across this river, but we don’t have any of those. We just have late-summer-river-must-be-low-what’s-impossible overconfidence. Call that determination. But after an hour, two, walking upstream and down testing the current’s strength, prospects look dim. Find a place to cross on foot, but loaded down and hands occupied with the bikes proves too much. There’s a refugio in the distance on the other side, a proper mountain home building bigger than expected. It looks empty, though. Sun roasting down on legs unexpectedly burnt yesterday, apprehension over this river mounting. Unfordable means we have to turn around and wrestle over that last pass again, rather than wrestling the one pass left before entering Argentina proper. We don’t want to go back. We’re also not high on energy levels, but searching more for a way across the river is more appealing than eating. There’s nothing. Then a horse train appears on the slope across the way, bringing hikers to the refugio. Paul darts across, negotiates, they come and pick us up. We spend the night sleeping on the refugio floor, eat dinner with the military guards stationed there and leave in the morning. Maybe the river is less strong in the mornings, and crossable with bikes then. Maybe. But probably not. Day 5: Refugio Real de la Cruz to a few km short of Paso Portillo. 1400m ascent today, from the refugio to the pass. We only made it 1100m, despite an early start and as much of the day hustling as we could. But then the legs just didn’t have more to give. We camp earlier than normal, judgment says better to sleep tonight and make the pass in the morning than hit the point now where suffering becomes exponential. Water supplies low, no streams until the other side of the pass. An hour ago that was good motivation to just keep going. Now it’s become tinges of dread. Huddle into the sleeping bag, meditate it all away, reflect that this is the last time we’ll be sleeping at 4000m. Sip of water. Tortilla with last three pieces of salami, cheese. Listen to the rocks breaking off the mountainsides and go tumbling down the valley, background atmosphere accompaniment music to soothe us through the night. Day 6: Over Paso Portillo to Tunuyan to Mendoza. Morning. Conversation minimal. Breaking up camp a rehearsed efficient effort, get everything attached to the bikes and then we just go. Round a nearby bend and we can finally see the pass, tiny little box cut into the ridge line above. Nothing up here now but rocks, sharp jagged debris. The valley sides are completely smooth in most places, winter avalanche paths cleaning away everything. The military guys at the refugio said they’re stationed here for a finite amount of time in the summer, but in the winter sometimes the snow buries them in for weeks. Top out at the pass, finally, the very last bit Herculean effort even compared to what came before. On the other side, there’s a proper dirt road all the way 2500m down. 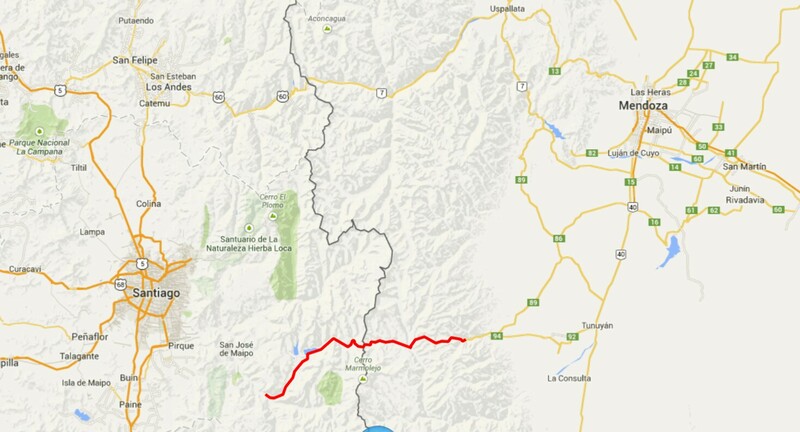 Argentina’s been working on constructing this road for a while, in a few decades it might even extend all the way to the other pass. Yeah right. Zoom down to civilization, from high-altitude cold to the first stream to the border control police station, battling slow inner tube leaks and wondering if the next rock will be the one we pinch flat on, but we don’t care, in the scheme of things those are low priority now. It’s hard to believe, in the end, sitting at a town store with everything we could want inside and a campground across the way and cars running up and down the streets, that just a few hours ago we were surrounded by quietness, nothingness, just a few people inhabiting that world with a mutual respect for the difficulty we all went through to get there. Now the pavement starts again. Put on a helmet, some music, off we go. Paul’s account and photos can be found here. We’ll get full route information up in a few weeks. Sun breakfast: eggs frittata w corned beef, Passover rolls, matzah, pineapple and a south American melon. Was the pineapple from SA too?